Shipbuilding has a long future on the River Clyde, building on Glasgow’s historic connections to the industry, a Royal Navy commander has said. HMS Defender, a Type 45 Destroyer, arrived in Govan on Friday in a return to the city where she was built in 2013. The ship is berthed at King George V Dock, around a mile away from where it was built and launched, and will be open to visitors throughout the weekend. HMS Defender’s Commanding Officer, Richard Hewitt, described the return as “a very special occasion”. 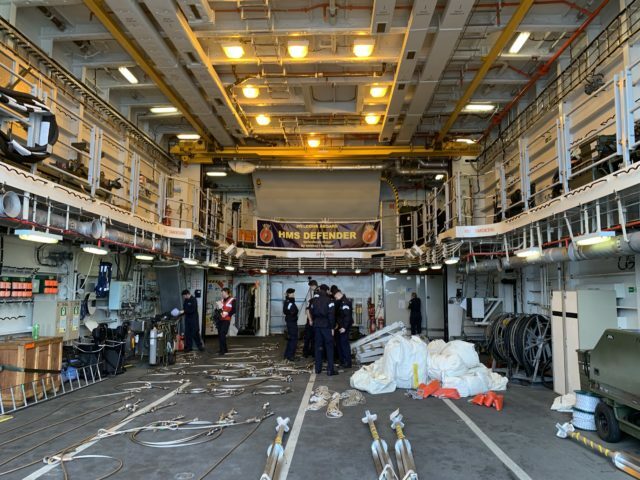 He said:”It was fantastic to arrive and see the HMS Taymar, who had a naming ceremony yesterday, seeing HMS Trent being built and looking not too far behind Taymar, and also the Type 26 which is being built on the Clyde as well. Prior to its arrival in Glasgow, HMS Defender had been escorting a Russian naval task group along the UK coastline – keeping a watchful eye on frigate Admiral Gorshkov and three auxiliary ships. Commander Hewitt highlighted the Royal Navy’s lasting commitment to defending UK waters. “Defender is one of the six Type 45 destroyers of the Royal Navy,” he said. He added: “Glasgow, in being our affiliated city, is especially important to Defender and to the Royal Navy as a whole, as part of Scotland’s commitment to the Royal Navy.